Thallium is not a rare element; it is ten times more abundant than silver. 1.Thallium was once part of medical pharmacopeia, being prescribed by doctors as a hair remover and given as a pre treatment for ring worm of the scalp. Thallium did not kill the ringworm, but it caused a patients hair to drop out, so that the condition could be more easily treated. 2.A radio- active synthetic isotope thallium-201, which has the half- life of 73 hours, is used in the diagnosis of heart disease. Murderers who poison people may think they are in the clear once their victim has been cremated. However, in the case of Graham Young it provided him with no such protection. His case became a milestone in forensic detection because the ashes of Bob Eagle, one of his victims, were reclaimed and analyse d by a technique known as atomic absorption Spectormetry. This revealed a level of 5 p.p.m. of thallium. This was well above any natural level of this element in cremated remains, and proof that he had been poisoned with it. Agatha Christie is often blamed for bringing thallium sulfate to the attention of would be poisoners. Her detective story The Pale Horse, which was published in 1961, described the symptoms of thallium poisoning. It showed how this could easily be attributed to other causes- in this case to black magic curses. In the 1980s and 1990s the Iraqi regime used thallium sulfate to dispose of its opponents, who appeared to die of natural causes. Poison to Graham Young, who, in 1971, put thallium sulfate into his workmates coffee at a factory at Bovingdon in Hertfordshire, England. Several workers were taken ill and two died of a mysterious illness. It was only when Young himself suggested that the cause might be thallium, that the strange illness was correctly diagnosed. Young was arrested, tried and found guilty of murder in 1972 and sentenced to life imprisonment. He had been previously on trial for poisoning his family and ordered to be detained in a secure prison for the criminally insane, but he was released after appearing to respond successfully to psychiatric treatment. He committed suicide in 1990. 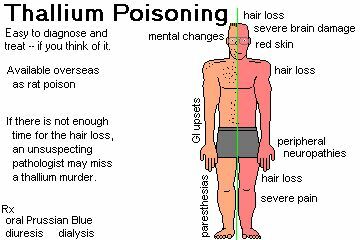 5.Not all thallium deaths are malicious. Some are accidental, such as the incident in Guyana in 1987 which affected hundreds of people, of whom 44 died, when they drank the milk from cows that had eaten molasses which had been poisoned with thallium sulfate in order to kill sugar cane rats . 6.Who discovered it? Another controversy! British scientist William crookes,1832-1919 observed some thing in his experiment new and named it thallium . But French scientist Claude August Lamy did thorough research and extracted thallium metal and so French credited him with the discovery! He was awarded a medal by the London exhibition committee. He sent the metal ingots to London exhibition. Crookes became furious and campaigned to withdraw the medal through his magazine. Eventually the exhibition committee felt obliged to award Crookes a medal also.